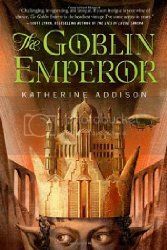 Katherine Addison's The Goblin Emperor is an exciting fantasy novel, set against the pageantry and color of a fascinating, unique world, is a memorable debut for a great new talent. The best review I could write for The Goblin Emperor is simply go and read it. I could go on and on ad nauseam about how much I love this book, but I don't think there is enough room in this post for that. The book grabbed me from the very start, as we meet Maia at the moment he discovers that his father, the emperor, and three older brothers have just died in an accident, which makes him now the emperor of the elflands. The only problem is, he's been in exile for ten years as he is a hobgoblin, half elf and and half goblin (his father didn't want him in court), and as such he has had no training in even the most basic of court etiquette, let alone what it takes to be emperor. What follows is a story permeated with court intrigue as Maia learns very quickly how to navigate the courtiers surrounding him as well as a mystery, as the accident that killed his father and brothers may not have been an accident after all. I had to read in small chunks; I didn't want to rush through the book too quickly. The story infiltrated my dreams, which doesn't always happen with books anymore, and I know it will stay with me for a long time to come. Maia is such a captivating character, as he quickly comes to terms with his place in life. If there was anything I found "wrong" with the book is I felt that maybe Maia picked up on how to navigate the court system and its customs maybe just a tad too quickly. For having never been to court or been schooled on court etiquette, he did seem to have a knack for what was needed of him in his role of emperor. If you can call that a drawback, that's the only one I can think of. Addison has created such a rich and believable world, which actually required very little world building in the beginning as the whole point of the story is discovering the world with Maia. The magic here is very sparse, and there's a little bit of steampunk dropped in for good measure. Again, just go read it. It's such a marvelous story and I'm anxious to see what magical lands Addison will take us to next.